Everth Cabrera recorded the first hit of the game with two outs in the bottom of the third and the Rockies got their first knock to lead off the sixth inning (Nolan Arenado double). In other words, Ian Kennedy and Franklin Morales both brought their A+ stuff to the park, a true pleasure to watch for baseball purists. Chris Denorfia singled after Cabrera broke the hit seal, but Jedd Gyorko left two runners in scoring position with a soft ground out to third base. The Rockies were unable to cash in on Arenado’s leadoff double, as the next three batters went down in order, seeing only 10 pitches in the process. This game was destined to be decided by which team could scratch and claw across a few runs, and for a while, the Padres looked like that team. Xavier Nady kicked off the fourth inning with a bomb to left field, a 1-0 cushion that felt like it may stand with Kennedy (two base runners allowed through six innings, while striking out six) absolutely dialed in. Unfortunately, that wasn’t the case. With his pitch count nearing triple digits, Kennedy began to fail to get ahead in counts like he did with regularity in the first six frames. With one out, Corey Dickerson drove a first pitch changeup to left field for a double and Troy Tuilowitzki worked a five pitch free pass. With Kennedy’s confidence shaken and Justin Morneau coming off of a strong performance, the game was going to be decided right here. The first pitch to Morneau was buried in the dirt and Kennedy had transformed from a strike throwing machine to a pitcher who needed a strike in the worst way. Morneau picked up on this and smoked a "get me over" curveball to right field for an RBI double that tied the game. With two runners in scoring position and Kennedy running on fumes, it was obvious that this game was now the Rockies to lose. Neither Wilin Rosario (RBI ground out) nor Arenado (ground ball single) hit the ball exceptionally hard, but they did enough to scratch across two more runs, two runs that felt like 10 in this pitchers dual. After falling behind, the Padres sent the minimum to bat over the final three frames, and wasted another solid pitching performance (San Diego pitchers recorded more strikeouts than base runners allowed). The Padres had had issues with runners in scoring position all season, but that wasn’t the case in this one (they hit .500 with RISP). That being said, having two at-bats with runners in scoring position is going to win very few games, and walking only once certainly isn’t going to increase your odds. For the evening, the Padres put seven men on base, three of which were erased via the double play. We saw last week that low scoring games are potentially a great thing against top shelf pitching (they beat Max Scherzer and had every chance to beat Justin Verlander), but the inability to put runs on the board will also keep lesser teams/pitchers (a reliever converted starter with a .406 career winning percentage) in the game longer than they should be. On a day were there were at least 10 runs scored in seven games, the Padres and Giants combined for just 10 hits. In other words, the Padres had them right where they wanted them. Both teams showed some promise early, as Angel Pagan led off the game with a ground rule double and the Padres got a one-out triple from Chris Denorfia, but the bats took the next 6.5 innings off. Tyson Ross was able to pitch around the extra base hit to start the game with relative ease, as it took him just six pitches to induce a fly out, record a strikeout, and force a harmless pop out. Matt Cain seemed destined to work his way out of an early pickle as well after Seth Smith grounded out to first base, failing to cash in Denorfia with one out, but his defense let him down. After Jedd Gyorko failed to lay down a first pitch bunt (a strategy that is questionable at least in the first inning of a 0-0 game for your cleanup hitter), Cain stayed away from the powerful second baseman, attempting to get him to chase off speed pitches out of the zone. He didn’t offer, so when Cain fell behind 3-1, it was no surprise that he was looking to move past Gyorko and challenge Will Venable. His changeup, however, ended up in the dirt, and scooted past backup catcher Hector Sanchez, allowing Denorfia to charge home. It wasn’t pretty, but it was a run scored, something neither of these teams would do again until the bottom of the eighth inning. How bad was the hitting (or good was the starting pitching)? At one point there were 18 batters set down in a row. That’s right. Not a single base runner, for either team, after a leadoff single by Brandon Belt in the fourth inning until Pablo Sandoval walked to lead off the seventh. Following Sandoval’s single, Ross issued a free pass (after going ahead 1-2 in the count) to the free-swinging Hunter Pence, giving the Giants multiple base runners for the first time all night. Ross seemed to be running out of steam a bit as his final three pitches to Pence and first two to Sanchez all missed the strike zone, but he caught a big time break. Sanchez (who’s a lifetime .260 hitter and hitting only .136 this season) had the green light and grounded a 2-0 off speed pitch softly up the middle (the only ball he put in play all day). Everth Cabrera stepped on second base and easily beat Sanchez to first with the throw, essentially killing this rally. With the tying run standing at third base, Brandon Crawford squared up a Ross fastball, but San Diego had him played perfectly, and Cabrera hardly had to move his mitt to end the inning. Ross (2-1 2.36 ERA) pitched a perfect eighth inning, concluding with back-to-back strikeouts of the pinch hitting Buster Posey and Angel Pagan (Ross has struck out 16 and walked two in his last two starts after opening the season by K’ing nine and walking nine). He had thrown 100 pitches on the dot (the third time in four starts he’s exited with exactly 100 pitches) and was lifted for a pinch hitter to lead off the home half of the eighth inning. With Matt Cain out of the game, the Padres had at least a chance to add an insurance run, and Yasmani Grandal wasted no time. The switch-hitting catcher waited three pitches to take the bat off his shoulder, seemingly timing the speed and delivery of reliever Juan Gutierrez, and then drove the 95 mile an hour fast ball over the right field wall, doubling the Padres lead and allowing the team to exhale a bit. The next three batters went down in order and it was up to Huston Street to retire the middle third of the Giants offense and preserve the victory. The scrappy Gregor Blanco went down on strikes, but forced Street to throw nine pitches, allowing Belt to get plenty of looks at the closer’s delivery and movement. Belt fell behind 0-2, but after a slider missed out of the zone, he drove a slider out of the huge ballpark, making this a one run game with arguably two of the Giants top four hitters due up. Sandoval battled a bit (seven pitches), but Street got him to swing threw a 3-2 changeup after throwing six consecutive sinker’s. With Pence representing the tying run, he worked a seven pitch walk, his second walk of the game (he didn’t draw multiple walks in a game until May 20th last season). San Diego fans held their collective breath as Pence swiped second base, putting the Giants a single away from ruining yet another strong pitching performance. But the Padre MVP was at the plate in the form of Sanchez (his error gave them the lead and his double play killed San Francisco’s lone rally), and he went down swinging to end the game. The drama provided by Street notwithstanding, this is Padres baseball. There were 20 strikeouts and only four walks, while the two teams combine to go hitless in ten at-bats with runners in scoring position. The Padres improved to 6-5 at home, winning four of their last six ball games (giving up a total of 14 runs in those contests). Being a Padre fan isn’t for the faint of heart, but they currently sit just two games out of first place and have the fourth lowest ERA in all of baseball. If this trend continues, I may quit writing here and pursue a simplistic gambling life style: betting the under in Padres games. For the fifth consecutive game (and 14th time this season), there were six or fewer runs scored in a San Diego game, a trend that seems likely to continue given what appears to be a much better pitching staff than anyone could have projected (through 18 games at least). Eric Stults faced the minimum through four innings while his offense was busy recording multiple hits in three of the game’s first five frames. Seth Smith (whose batting average jumps 36.5% against righties this season) led off the second inning with a sharp single to left field, giving the Padres a real chance to mount an early rally with, in theory at least, their best two hitters coming to bat. These days, the best you can hope for from the struggling power hitters in the middle of the order (Chase Headley and Jedd Gyorko) is to advance the runner to scoring position, something Gyorko managed to do with a swinging bunt after Headley struck out. That proved to be enough, as Yonder Alonso smoked a ground ball back through the box for a rare two-out RBI knock. As Tim Hudson and Stults dueled through four innings, it seemed very possible that the 1-0 lead might just be enough to escape with a second consecutive victory. For the game, 73% of Stults’ pitches were strikes, but he fell behind the powerful Michael Morse with the first two pitches to open up the fifth inning. Not wanting to issue a free pass to a hitter to open an inning, Stults elected to groove a fastball (and the term fastball is simply referring to his grip on the ball, as he rarely touches 90 mph with the pitch) … mistake. Morse (who had 31 homers just three seasons ago) took the BP fastball over the centerfield wall, tying the score. But as has been the case, the struggling Padres lineup answered in the bottom of the inning. Say what you will about this offense, but they are rarely kept quiet after their starter gives up a run. Alexi Amarista recorded a bunt single on the first offering from Hudson and advanced to second on an errant pickoff attempt. Stults then helped his own cause by laying down a sacrifice bunt, putting a runner on third with only one out. Everth Cabrera made sure the middle of the order didn’t have an opportunity to blow this opportunity, lacing a 2-0 pitch into the gap for an RBI triple and a 2-1 lead. Feeling that runs were going to be at a premium, Cabrera tried to score on Will Venable’s ensuing ground ball, but he was cut down at home, effectively ruining any chance at the Padres extending their lead. Stults would work around a one-out single by Hudson in the next half inning, completing his work for the night (six innings, three hits, no walks, and one earned run). The bullpen couldn’t possibly be as effective as the starter, could they? As it turns out, they were even better. Nick Vincent, Dale Thayer, and Joaquin Benoit (in place of a tired Huston Street who had thrown 31 pitches the night before) allowed just one Giant to reach base, striking out five of the 10 batters they faced. For good measure, the Padres added an insurance run in the home half of the eighth inning on a suicide squeeze by Chris Denorfia (probably not a play most teams call for a pinch-hitter in the cleanup spot, but hey, it worked). Benoit retired the top three hitters in San Francisco’s lineup without any issues, needing only seven pitches to do so. The Padres have impressed after a slow start and have proven that they can win their brand of baseball: great teams can win in any style of game, but playoff teams can force you to play their style of game and beat you more often than not. Interestingly enough, not a single walk was drawn in this entire game. Iâm not in love with the fact that 70% of non-strike out outs were fly balls, but at Petco, that’s not a major worry. The starting pitching is probably overachieving right now, but if you told me that Gyorko and Headley would both be under the Mendoza line, I’d happily take a .500 record through 18 games, and that is exactly where we stand. The seven total runs may seem like an outburst, but this game followed a similar path as the previous 18. There were 10 hits and nine walks for a total of 19 base runners, eight of which occurred before the eighth out of the game was recorded as we then settled into another pitcher’s duel. Angel Pagan began the game by setting a patient tone, popping out on a seven pitch at-bat that featured six two-seam fast balls. Hunter Pence then worked a five pitch walk (how San Diego continues to walk this guy I do not know) as Robbie Erlin threw three more two-seamers to end the at-bat. Buster Posey stepped to the plate and got the one pitch you’d assume he was sitting on: a two-seam fastball. Elite hitters don’t miss pitches that they know are coming, so it should be no surprise that Posey deposited the first pitch into the center field bleachers. The Padres were unable to capitalize on a leadoff single by Everth Cabrera, putting Erlin back on the bump without much time to adjust his approach. He walked Brandon Hicks on eight pitches (six two-seam fastballs), gave up a first pitch (two-seam fastball) single to Brandon Crawford, and walked the bunting Tim Lincecum on six pitches (five two-seamers). Find a pattern yet? With the bases loaded and one out, what pitch do you think Pagan was waiting on? The speedster sent a frozen rope out to centerfield on the fourth pitch he saw (the third two-seam fastball), and just like that the home team was down four runs. Erlin would settle in and finish with a decent line (six innings, six base runners, and just those four runs), but asking this offense to battle out of a four run hole is a lot. In the bottom of the third inning, San Diego mounted a two-out rally, loading the bases with two singles and a walk for Chase Headley. The third baseman finally came through with a timely hit, but a strong relay from the Giants cut down Xavier Nady at the dish as he tried to make it a one run game. Still, the deficit was cut in half and there was plenty of baseball left to be played. The two teams combined for just one hit over the next 3.5 innings, and even that didn’t generate a scoring opportunity as Cabrera was gunned down by Posey as he attempted to swipe second base. With Lincecum already at 101 pitches, it seemed likely that the Padres were going to have to comeback against the Giants bullpen, but San Francisco elected to keep their tiring starter in the game to chew up one more inning. His first pitch after the seventh inning stretch was a slow changeup … a slow changeup that Nick Hundley drove on a line to left field. The ball cleared the wall, making this a one-run game and ending Lincecum’s afternoon (six innings, 10 base runners, and seven strikeouts). The pitching had dominated since that offensive start in the first two innings, and both bullpens picked up where the starters left off. No reliever surrendered a single hit (three walks in the six innings they combined to pitch) and the Padres were unable to threaten at any point over the final three innings. The Padres have gone 5-3 since last Sunday, with two of their losses coming in a game in which their starter pitched at least six innings and gave up four or fewer hits. The pitching staff will be put to the test in the coming week, as San Diego travels to Milwaukee and Washington for seven games in seven days. Simply put, Andrew Cashner didn’t have his A-game. He had a decent outing (six innings and four earned runs), but that simply isn’t going to get it done with a limited offense against the hottest team in baseball. 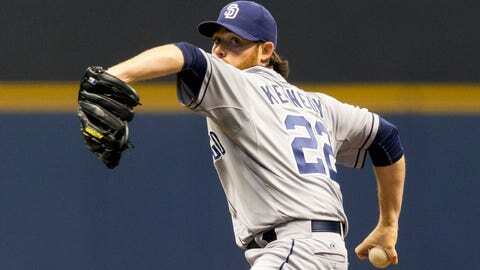 Most of the damage against the Padres’ ace was done in a third inning that started in very odd fashion. Cashner, who has been unhittable all over most of the last calendar year, gave up a leadoff double to his opposing number (for the record, Wily Peralta is a .152 career hitter). The BrewCrew has been rolling on offense, so approaching the top of the order with a runner in scoring position and nobody out is asking for trouble. Cash was able to induce a ground out from the excitable Carlos Gomez, but the 2-3-4 hitters made him pay dearly for allowing the pitcher to reach base. Scotter Gennett drove the ball to the centerfield that trickled all the way to the wall, allowing him to replace Peralta on third base. The damage seemed to be over when Ryan Braun lifted a sacrifice fly to center, clearing the bases and now with two outs, but Aramis Ramirez had different ideas. The veteran third baseman took a second pitch fastball over the center field wall, giving Milwaukee a 3-0 lead against a Padres team that hadn’t scored more than three runs in four consecutive games. As they seem to always do, however, the Padres would answer immediately. Are they a great offense? No. But they do seem to have a knack for stemming momentum when their pitcher gives up some runs, a trait that very good teams tend to possess. Seth Smith led off the inning with a grounder just out of the reach of an out-stretched Gennett and Chase Headley watched four straight pitches miss the zone. After a harmless Jedd Gyorko fly out, an aggressive Yonder Alonso connected on the first pitch he saw for an RBI single. Chris Denorfia came to bat with a similar mindset, recording an RBI groundout on the first strike he saw. Just like that, the struggling Padres got two of the three runs back, gaining confidence and momentum in the process. But this just wasn’t Cashner’s night (a common theme for pitchers opposing this Brewers offense). Gomez led off the fifth inning with a double (no bat flip though) and would score on an RBI single from Braun. Denorfia led off the seventh frame with a bomb (how good is this guy? ), once again pulling San Diego within a single run. Hundley (double) and Tommy Medica (error) reached base, and after an Everth Cabrera bunt Peralta’s evening was over. Reliever Will Smith entered the game and promptly walked Xavier Nady on five pitches to load the bases with only one out. Despite five of his first six pitches being out of the zone, Seth Smith swung on the first pitch that was close and flew out to shallow left field, not nearly deep enough to score Nick Hundley from third. Smith then got Chase Headley to go down swinging on three pitches, the last of which was in the dirt. San Diego’s ‘pen worked a bend-but-don’t-break two innings (five base runners allowed), not the ideal way to record six outs, but they did their job and kept this a one-run deficit. The Padres worked two walks off the Brewers bullpen in 2.2 innings, but ultimately never really threatened after blowing the bases loaded opportunity in the seventh. They battled again, but truly good teams rarely have a pitcher like Willy Peralta beat their ace. This is going to be a stressful season for Padre fans, but this team is very competitive and will continue to play nail-biters if the pitching can sustain this level of success. Check your calendar: itâs 2014, right? Yovani Gallardo (seven innings, five hits, and one earned run) and Ian Kennedy (six innings, four hits, and one earned run) squared off in a pitcher’s duel that was much more likely to take place in 2011, when both starters recorded career-high win totals along with their best yearlong ratios (ERA and WHIP) as pitchers in the big leagues. Even the runs scored against Gallardo and Kennedy were somewhat fluky. The Padres took a 1-0 lead in the top of the fifth inning on a Kennedy squeeze bunt and Brewers tied things up in the bottom of the frame on Scooter Gennett’s seventh career homer. Neither pitcher dominated out of the gate, but they did just enough to keep the opposition from getting on the board (six runners were left in scoring position in a two inning stretch from the bottom of the second to the middle of the fourth). Seth Smith and Chase Headley recorded back-to-back singles in the sixth inning, but a first pitch slider from Gallardo induced an inning-ending double play off the bat of Jedd Gyorko, halting the only real rally that had a chance. As good as the starting pitching was, you could make the argument that the bullpens were even better. Once both ‘pens were introduced to the game, nine of the next 12 outs were recorded via the strikeout (six of the swinging variety). This had all the makings of a game that would be played deep into the night, a sign that the Brewers seemed to acknowledge when they inserted Alfredo Figaro (a part-time starter last season that had yet to make an appearance this year) into the game. 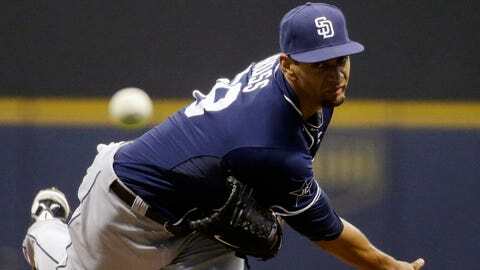 The Padres, however, decided to stick with their short-term relievers, and were rewarded with outstanding results. When all was said and done, each of the six San Diego hurlers recorded at least as many strikeouts as hits, a true accomplishment against what has been the most potent offense in the big leagues. Figaro had been cruising along in his first two innings, as only one batter made decent contact and he sat down six of the first seven batters he faced (three by way of K). I’m no scout, but it was clear that the long reliever was having success with his mid-90âs heater (all six outs he recorded up to the 12th inning had come on a fastball). Headley must have picked up on this as well and was sitting dead red to lead off the inning. A slow slider was the first pitch he saw, a pitch he had no chance at had it been a strike as it was 15-20 miles per hour slower than the pitch he was waiting for. Luckily, the pitch missed and Figaro felt he couldn’t fall behind the leadoff hitter. He challenged Headley with a good fastball, but professional hitters can time a bullet, and Headley did just that. The switch-hitter deposited the pitch over the right center field wall, putting the game in the hands of the Padres steady ‘pen. Huston Street was asked to retire the top three hitters on Milwaukee’s roster, no small task given the fact that Carlos Gomez is allowed to play while he appeals his three-game suspension. While he fell behind all three hitters early in the count, the closer stuck to his bread and butter, featuring one nasty sinker/slider after another. After Gomez and Gennett hit harmless grounders to short, Ryan Braun was caught looking on a sinker to end the game. It was only Street’s second 1-2-3 inning in his last six appearances, but it was his seventh save (good for second most in the MLB) and a great sign moving forward. I’ve said it before and I’ll say it again, for this Padres team it isn’t the quantity of hits, rather the timing of the few hits they do get, and lately, their timing has been nothing short of perfect. If every game started like this one, I’d pick the Padres to win their division. Everth Cabrera doubled to lead off the game, advanced to third on a Chris Denorfia groundout, and scored on a Seth Smith sac fly. That wasn’t so hard, was it? Unfortunately, the rare easy offense was followed up by an equally rare struggling starting pitcher. After striking out Carlos Gomez (Not all stats are created equal) , Scooter Gennett singled on a well-hit ball to right field and Ryan Braun brought him home with a screaming line drive to center field. The lead took three batters to gain and three to lose, but Tyson Ross was able to find momentary composure and work himself out of the inning without further damage. Kyle Lohse settled in, as most pitchers seem to do sooner or later against this Padres offense, and retired 14 of the next 15 batters he faced. Ross wasn’t as fortunate, as the bottom half of the lineup proved to be a major thorn in his side. The deep Brewers batting order brought an aggressive approach into this one, resulting in Khris Davis and Lyle Overbay both recording line drive singles to start the second inning, seeing a total of four pitches in the process. Jean Segura, who had been struggling since the all-star break to live up to the blistering first half of last season, took the first pitch and then swung wildly at a ball in the dirt. It looked like just another poor at-bat coming, but when Ross hung a changeup, Segura didn’t miss it, and roped the pitch over the left field wall. Milwaukee scored four runs before they recorded four outs, a high-scoring pace that the Padres simply cannot contend with. With Lohse absolutely dialed in, the margin of error for Ross continued to shrink, and while he pitched better after the rough start, he couldn’t keep pace with the Brewers starter. Davis crushed a 3-1 fastball, the fifth consecutive fastball he saw, to lead off the fourth inning, extending the Brewers advantage to four runs. San Diego managed to scratch across a run thanks to a line drive that deflected off of Lohse and a fielding error by Overbay, but they still weren’t making solid contact and the three-run deficit might as well have been 33. Alex Torres provided two solid innings of relief and further increased my confidence in this Padres ‘pen, but the damage had already been done. Milwaukee’s relievers (two innings, no hits, two walks, and four strikeouts) were just as good as Lohse had been and the Padres never once threatened to mount a comeback. A 3-4 week isn’t the end of the world, especially given the quality of opponent, but not winning "winnable" games is a concern. San Diego doesn’t have enough talent to leave wins out on the table, which means they need to win when Cashner is on the bump (they didn’t this week) and win most games in which they hold a lead (lost two such games this week). They open a four-game set in Washington against Bryce Harper and the Nationals tonight and then head to San Francisco for a three-game set. They are set to face three aces (Steven Strasburg, Madison Bumgarner, and Matt Cain), while sending out their top two pitchers against the back end of the Nats’ rotation. So when it comes to predicting the number of wins this week, it really comes down to how many games do I think the Padres can eclipse three runs. I think this is a tough week for San Diego, and matching this past week’s three wins would have to be considered a success.